I used to work at a casino dealing poker. I worked for tips, and every hand I dealt was another opportunity for me to make a dollar. I started calling the players that tipped above and beyond anyone else “Unicorns”. On hands where I might make $1 or $2, a unicorn would tip $5 or $10. A unicorn tipped so well, I almost felt bad for taking them because the work I had done had not been worth what I was paid. However, I loved dealing to unicorns. Just like the name implied they were rare, almost unseen. You heard stories about other dealers finding unicorns, but it was not usually your story to tell. My unicorn moments as a dealer, were few and far between, but I was happy to experience them. Those nights were I made 3x’s or more than I was used to were stories I still keep with me. Of the thousands of players I dealt to, the unicorns were the names I remember…bill, Steve, and Jason. Those rare moments in life that are memorable, bless you more than you deserve, and are the stories that you share with others never stop happening. There are big differences between the unicorn moments I had as a dealer, in my life before Christ, and my unicorn moments in life with Christ. Knowing Jesus opens your eyes to a number of truths. Creating a relationship with Christ for me included dropping all the ways I used to believe, see things, and act in order to pick up the teachings of Christ, His vision, and His behavior. When I think about my unicorn moments then and now, I am reminded of the ways I used to see rare and undeserved blessings, and how much differently I think now. I always thought luck was real. My friend constantly said luck is when preparation meets opportunity. I guess I just always believed him. So, every time I found myself at the receiving end of a blessing I felt lucky. I used to hear the word lucky a lot around the casino. Good luck, that’s lucky, and you got so lucky, as well as I got no luck, they got so lucky, and I wish I was that lucky. When the guys would tip big I would always tell people I was so lucky. I don’t know why I believed my blessings were random, or up to chance. My friend was right when he said something happens when preparation meets opportunity, it just isn’t luck. A blessing is what happens when preparation meets opportunity. When we reach an opportunity to be blessed in life, as rare as those moments seem to come, do I want to really want to tell people I’m lucky? Is that really what is happening when my hard work meets opportunity? Luck shouldn’t get any credit. It has done nothing to deserve it. Luck is a made up word to describe being, or not being blessed. Blessings don’t come from luck, they come from faith. Faith that our future is better than our current situation. If we believe luck is real there is no need to prepare. There is no need to find opportunity because luck finds you, but I didn’t know that before. I used to think blessings came from luck, but the truth is blessings came from faith. I am not lucky, I am blessed. I used to tell people I was the 2nd best poker dealer in St. Louis. When people would ask me who the first was I would tell them whichever dealer you ask is always believes they are the best one. However, they all think I’m number 2. I was very prideful of my abilities to deal fast, make minimal mistakes, and be the dealer all the players wanted to have at their table. So, when those moments when the unicorns, or great, rare, and undeserved blessings, showed up in my life I thought I had somehow deserved it. It was the universes way of repaying me for all the great ability I had a poker dealer. It wasn’t the universe repaying me, it wasn’t karma, and I didn’t believe it was God because I didn’t believe in Him at the time. I was, however, being blessed by God, even though I didn’t care to notice. God cares for all His children, even if they don’t believe. Matthew 18:12 says “What do you think? If a man owns a hundred sheep, and one of them wanders away, will he not leave the ninety-nine on the hills and go to look for the one that wandered off?” God looks after those that wander, even more so than He does the majority of the group. After I found Christ as my savior, and started to read the Bible I came across this verse. I recognized this behavior because I saw it all the time in the poker room. Players carry their chips, or money, in a plastic rack designed to hold them, and sometimes those containers get dropped. When those containers got dropped I got to see Matthew 18:12 come to life. After a rack was dropped and a chip would fall on the ground the person who the chip belonged to would stop everything they were doing to look for that chip. If the chip rolled under a table, they would move chairs, ask people to move, and get on their hands and knees to look for ONE CHIP! Meanwhile, on the table they leave behind a rack of chips, which contains 99% of their money. It is crazy to see the measures someone will go to find something that is lost. That is what Jesus does for us. I was once that one chip, and Jesus left behind 99% of His people to come looking for ME! I can’t believe the measure the creator of the universe would go to find someone that is lost. I didn’t deserve to be found, Jesus gave me the gift of salvation. I once thought I received all the blessings I got because I was good and deserved them. Jesus taught me I deserve nothing, but still receive because of grace, which means unrequited gift. Grace is the unicorn I always wanted to show up, but never knew I needed. 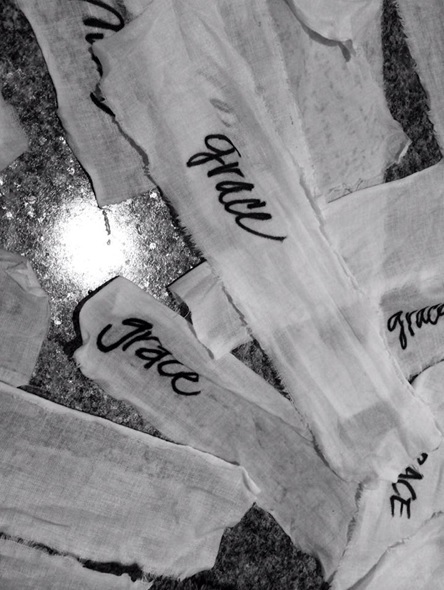 Grace is the great, rare, and undeserved blessing my life received. I used to think blessings made my life better. I thought extra money, a new girlfriend, or a free drink were answers to burning question in my heart. What am I supposed to do with my life? I had no idea that those things make no difference. Blessings are good, but are not the answer to that question. I now believe Jesus is the answer to the question: What am I supposed to do with life? All the unicorns that follow are nice, but unnecessary because when Jesus finds you, everything you need has been provided. We don’t need blessings to cover our needs, we need grace. Grace is enough (2 Cor. 12:9). Grace is real, and it saved me from being a problem gambler, with severe depression, with no hope for the future. Grace transformed me into a person with high expectations for my life, a desire to serve others, who lives with an abundance of joy regardless of my circumstances. Grace is my unicorn, and I now know unicorns are real.